Saturday 25 November was the International Day for the Elimination of Violence Against Women, and to mark the day PRI live-streamed the award-winning play Key Change, from the Open Clasp Theatre Company. A New York Times Critics Pick, Key Change highlights the complex journey that women who come into contact with the criminal justice system face, and the impact of gender violence on their lives. 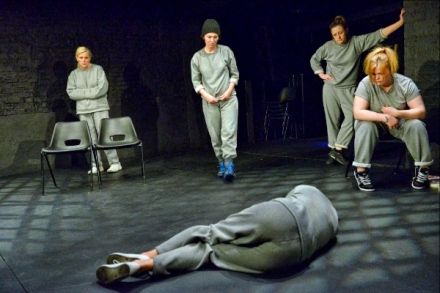 The play was devised with women in HMP Low Newton, UK and originally toured in male prisons, and it was also performed at the Houses of Parliament, UK in 2016. It was described by the New York Times as a ‘moving, intimate and superbly acted drama about women’s lives in…a British prison’. Key Change is now available to watch free and on demand until 10th December 2017. Click here to watch. Please note Key Change has adult themes and language, including domestic violence, abuse and drug abuse. PRI’s research into women in the criminal justice system has found that a vast number of women in prisons around the world are survivors of domestic violence. A research project carried out by PRI to improve the evidence-base on the characteristics of women offenders found that 49 per cent of women in prison in Tunisia – and 37 per cent in Uganda and 38 per cent in Kyrgyzstan – had experienced domestic violence. Our 2015 publication on the added value of the Bangkok Rules highlighted that the pathway to prison for many women offenders is paved with domestic or sexual violence, mostly at the hands of their partners or family members. Last year, our report with Linklaters, Women who kill in response to domestic violence, underscored global failures in criminal justice systems in recognising the cycle of violence faced by women.